If you have the habit of transforming into a ravening beast when the moon is full, then you've come to the right place! 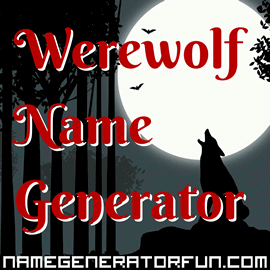 Embrace your inner animal with our werewolf name generator! The word 'werewolf' is originally derived from a late medieval English word, but the word 'lycanthropy' – meaning both the ability to transform into a wolf, and the act of doing so – is much older, dating from the Ancient Greek word ukánthropos, which was used to describe certain clinical symptoms of feral behaviour. There have been myths of men able to transform themselves into wolves in both the Greek and the Roman eras, but the modern concept of werewolves didn't really start appearing until the 14th Century, in medieval Europe. It's largely held that this had a lot to do with the presence of wolves in various areas of Europe as dangerous predators, as well as importance of the wolf in various German pagan traditions. Soon rumours of men being able to turn themselves into wolves were spreading like wildfire. Werewolf mythology soon split into two distinct types – the 'Germanic' werewolf, that was soon strongly associated with the fear and suspicion surrounding witchcraft and witches, and the 'Slavic' werewolf, which was more closely associated with vampires or revenants. (This is why Count Dracula in Bram Stoker's original novel shares many apparent characteristics with traditional werewolves.) The explosion of witch-hunt activity that followed resulted in the peak of werewolf-related attention from the 1500s to the 1600s, with a number of treatises being written on lycanthropy and hundreds of accusations that resulted in massive numbers of deaths. This cemented the werewolf's place in European culture as a figure to be feared, and werewolf myths only grew in their potency as the centuries passed. Bram Stoker's Dracula in 1897 was the first major work of popular fiction to properly draw on this mythology, and in the novel it's suggested that the myths of werewolves are created due to Dracula's ability to transform into a wolf. Werewolves didn't have to wait long before making the leap into movies – their first appearance was in Werewolf of London in 1935, but it was The Wolf Man in 1941 that really caught the public's imagination, with Lon Chaney Jr's tragic portrayal of lycanthrope Lawrence Talbot coming in for particular praise. Since then, werewolf depictions have often split between menacing threats and more sympathetic portrayals, often playing heavily into metaphors like repressed anger, the changes brought about by puberty or discrimination. An American Werewolf in London was a landmark in onscreen special effects, rendering a werewolf transformation in ways that had never been seen before, and The Howling soon did the same with its more satirical portrayal of lycanthropes. Werewolves play a major part in the mythology of Stephanie Meyer's Twilight novels, and have also ended up a major part of the subgenre of urban fantasy romance. Whatever transformation arrives next, our fascination with the werewolf – as well as with the darker, more primal side of our nature – shows no signs of going away.